Chinese brand Xiaomi has unveiled its latest smartphone- Xiaomi Mi Mix 2S in Shanghai. The successor to last year’s hugely popular Mi Mix 2 brings in the same design with some notable hardware changes including ARCore support, a new processor and also a dual camera system. The dual-SIM (Nano) Mi MIX 2S runs MIUI 9, and bears a 5.99-inch full-HD+ (1080×2160 pixels) in an 18:9 aspect ratio and with a pixel density of 403ppi. It supports the DCI-P3 colour gamut. It is powered by the Qualcomm Snapdragon 845 SoC coupled with the Adreno 630 GPU, and either 6GB or 8GB of LPDDR4X RAM. 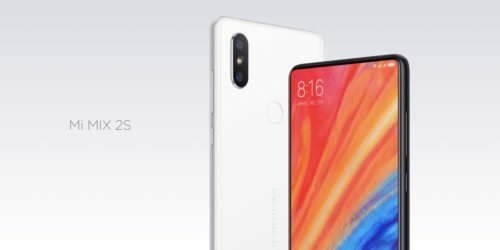 Xiaomi Mi Mix 2S has introduced two 12 Megapixel sensors. One with a regular lens, a bigger pixel size of 1.4 ultra pixels and the other is a telephoto lens for better bokeh and optical zoom. On the front, there is a 5-megapixel camera with HDR features and Face Unlock capabilities. Xiaomi is also touting AI-based beautification features. The smartphone is backed by 3,400mAH battery with Quick Charging 3.0 support. The company claims that the smartphone supports 7.5W charging which fully recharges the battery in 2 hours and 40 minutes. Other features include 4G LTE, Wi-Fi 802.11ac (dual-band, 2.4GHz and 5GHz), NFC, Bluetooth v5.0, GPS/ A-GPS, the fingerprint sensor on the rear panel and USB Type-C.
Xiaomi has launched its high-end flagship phone with a near bezel-less screen in China at a starting price of RMB 3,299 (Approx. Rs 34,200) for the 6GB RAM+ 64GB storage model. The 6GB RAM+ 256GB storage model costs RMB 3,999 (Rs 41,400). The top-end model will be bundled with a wireless charger. The wireless charger has been priced at RMB 99. The Mi Mix 2S will also be available in 6GB RAM and 128GB storage option for RMB 3,599. Pre-bookings for the phone have opened while the phone will go on sale from April 3.